The commercial graphic designer Ilmari Sysimetsä studied to become an art teacher of drawing at the Central School of Arts and Crafts. He graduated in 1937.A year earlier, Sysimetsä had started to work for the advertising agency Erva-Latvala as a commercial graphic designer. There he worked with, among others, Hans Björklind and Aarne Nopsanen. 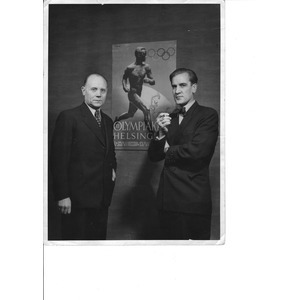 Sysimetsä stayed at Erva-Latvala until war broke out in 1939, but returned there for a year in 1941.Ilmari Sysimetsä is chiefly known for his famous Paavo Nurmi poster with which he won the poster competition in 1938 before the planned Olympic Games in 1940. His poster was eventually used for the Olympics in 1952. 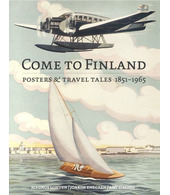 From an international point of view, this elegant poster came to be one of Finland’s most famous posters. In 1949, Ilmari Sysimetsä set up his own serigraphy printing house in Helsinki. During the years 1948-1953 Sysimetsä acted as secretary in what was then known as the Association of Finnish Artistic Draughtsmen. He had an innovative attitude towards, among other things, the design of school textbooks. For example, in an interview for the newspaper ”Nya Pressen” in 1948, Sysimetsä suggested that it would be a good idea ‘to liven up the dry texts of school books with fresh drawings’.